Yesterday I went to the padstow Christmas festival and even with the pouring rain all night had a really wonderful night. 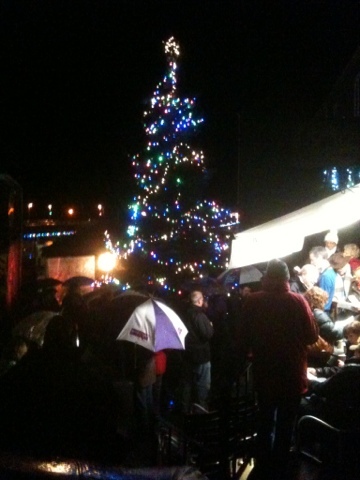 With late night shopping, live music and mulled wine to get you in the spirit, not to mention father christmas arriving by fire engine followed by a lantern procession, the rain sadly kept on pouring but this did not keep the crowds away at all. The local produce market was bustling with local ciders and ales to be tasted not to forget the wonderful cake and chocolate stalls and everything in between with cookery demonstrations and even a debate was held with local celebrity chef Rick Stein. It was then time to go back out into the rain to huddle around the harbour to watch the fireworks then off up the hill to circle the giant Christmas tree and sing carols, if cold nights and pouring rain won't stop the padstow locals nothing will. Padstows Christmas festival continues until Sunday and I thoroughly recommend popping over their for a visit a glass of mulled wine and a mince pie.